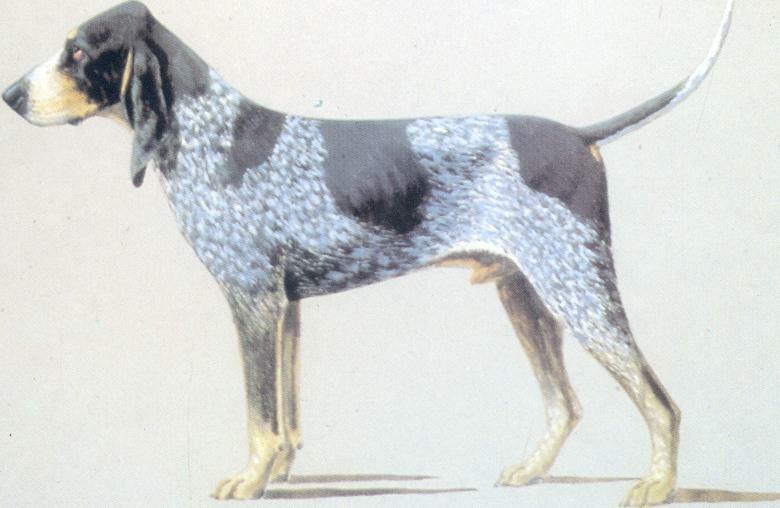 : Scenthound used for hunting with the gun and sometimes for coursing big game, but also hare hunting, generally in a pack or individually as a tracking hound. : He is of a very old breed; contemporary of the St.Hubert-Hounds he composed, in the 14th century, the packs of Gaston FEBUS, Comte (count) de Foix who used him to hunt the wolf, the bear or the boar. : Ancient breed of dog, of outstanding French type when it comes to the head, the coat and the expression. Imposing, giving an impression of calm strength and of great nobleness. : Very fine nose; endowed with a sonorous howling voice, with deep tones. Very intent in his way of hunting. Instinctively a pack hound. Temperament calm; obeys orders easily. : Seen from the front, slightly domed and not too broad; the occipital protuberance is marked. Seen from above, the back of the skull is ogival in shape. The forehead is full. : Of equal length to that of the skull; strong; nasal bridge slightly arched. : Quite drooping, covering well the lower jaw, giving the front part of the muzzle a square profile. The corner of the lips is well marked without being loose. : Scissor bite. Incisors set well square to the jaws. : Lean; the skin shows one or two folds. : Oval shape; appear slightly sunken beneath thick eyelids; brown. The lower lid sometimes shows a certain looseness. Expression gentle and a little sad. : Characteristic of the « blue dog » they are fine, curled in, ending in a point and must reach beyond the extremity of the nose. The leather is narrow at its base which is situated well below the eyeline. : Moderately long; slightly arched; dewlap developed. : Rather long but well supported (firm). : Slightly sloping, emphasizing the haunches. : Long, broad; let down to elbow level. Forechest broad. Ribs moderately rounded and long. : Flat and well let down. : Rather thick, sometimes there may be some longer and coarser, slightly offstanding hairs (like ears of grain) towards the tip; reaching the point of the hock; strong at its root; carried sabre fashion. : Quite long and muscled, well sloping. : Strong bone structure; tendons prominent. : Of a slight elongated oval; toes lean and tight. Pads and nails black. : Broad, slightly bent, well let down. : Quite thick, supple. Black or strongly mottled with black patches, never entirely white. Mucous membranes (hairless zones) black. : Short, quite thick; very dense. Entirely mottled (black and white) giving a slate blue colouring effect; either marked or not with more or less extended black patches. Two black patches are generally placed at either side of the head, covering the leathers, surrounding the eyes and stopping at the cheeks. They do not meet up on the top of the skull; they leave a white interval in the middle of which there is often a small black oval spot, typical of the breed. Males 65 to 72 cm. Head: Too short. Skull too flat or too narrow. Leathers set high, short, insufficiently curled in. Body: Lack of substance. Slack (soft) back. Rump falling away. Limbs: Cowhocks seen from behind. Splayed feet. Bone structure insufficiently developed. Straight shoulder. Splayed feet. Cow hocks, seen from behind. Coat (Hair): Too fine and short. Any coat other than that indicated in the standard.